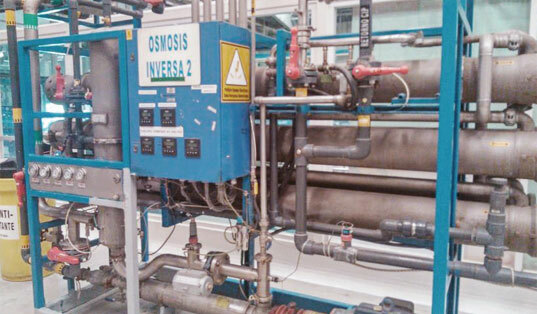 Coca-Cola FEMSA operates a reverse osmosis (RO) water treatment plant for its bottling operations in the Boca del Río facility in Veracruz, Mexico. 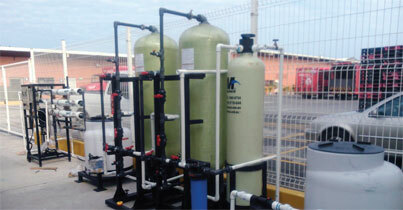 The plant has two reverse osmosis systems, each designed to produce 90 gpm of permeate. As the largest franchise bottler of Coca-Cola products in the world, Coca-Cola FEMSA uses the RO plant to treat blended well and municipal water for use in its products. Pre-treatment of both the municipal and well water includes media f iltration to remove iron, carbon beds for chlorine removal, and cartridge f iltration to catch any particulates. Water quality standards are high for food and beverage manufacturers and Coca-Cola FEMSA was facing some costly challenges in maintaining the quality of their water. They were experiencing high variability in their system performance and were relying heavily on the more costly municipal water instead of their preferred well source. With only 26% of their water sourced as well water, and 74% coming from the municipal system, Coca-Cola FEMSA’s water costs were higher than desired.The plant also suffered from excessive membrane scaling, requiring costly cleanings every month and a half. PWT began working with Coca-Cola FEMSA in April of 2014. After a complete check-up and review of the RO plant and an alkaline, acidic, and silica cleaning of both systems, PWT established the basis for a one month trial of SpectraGuard™ 100 dendrimer-based antiscalant in one of the RO systems. The plant had been using a competitive phosphonate/polymer blended antiscalant which was maintained in the second RO system for the trial duration to act as the trial control. Initial results showed better performance with the SpectraGuard™ 100 at half the effective dosage of their previous product, but the results did not meet Coca-Cola FEMSA’s objectives. Several factors impacted the test results including the system’s age, mechanical issues, and pretreatment upsets. To overcome the impact of the system’s age, mechanical issues, and pretreatment upsets was having on the test results, PWT provided a 6 gpm RO pilot plant. This plant was used to not only demonstrate the impact SpectraGuard™ 100 could have on their RO system’s scaling issues, but also to understand how improvements to their pretreatment system could improve overall results. When SpectraGuard 100 was used with the pilot plant, they were able to use 100% well water and achieve the system design recovery of 65%. PWT recommended a SpectraGuard™ 100 dosage of 2.7 ppm, a reduction of 33% from the 4 ppm of their current antiscalant product. As a result, the Boca del Río plant was able to achieve an immediate reduction in antiscalant costs of $4,000 per RO system per year. Having an even bigger financial impact were the changes made to reduce reliance on municipal water sources. To achieve this, PWT worked with Coca-Cola FEMSA to identify improvements that included better particulate filtration for more effective removal of suspended solids, automatic flushing of the membranes, and a strategy to minimize growth of bacteria on the membranes. These improvements, along with the use of SpectraGuard™ 100, has eliminated their reliance on municipal water, allowing the plant to exclusively use well water for their production and achieve recovery rates of 65%. Coca-Cola FEMSA was able to realize an annual reduction in water costs by as much as $76,000 by reducing their reliance on the municipal water ($0.697/m3) in favour of the less expensive well water ($0.324/m3).